Last fall Michael decided we needed to cover our fruit trees with netting to protect the harvest from the local wildlife, and after seeing similar techniques on fruit trees while on a trip to Okinawa, our collection of net bags grew. 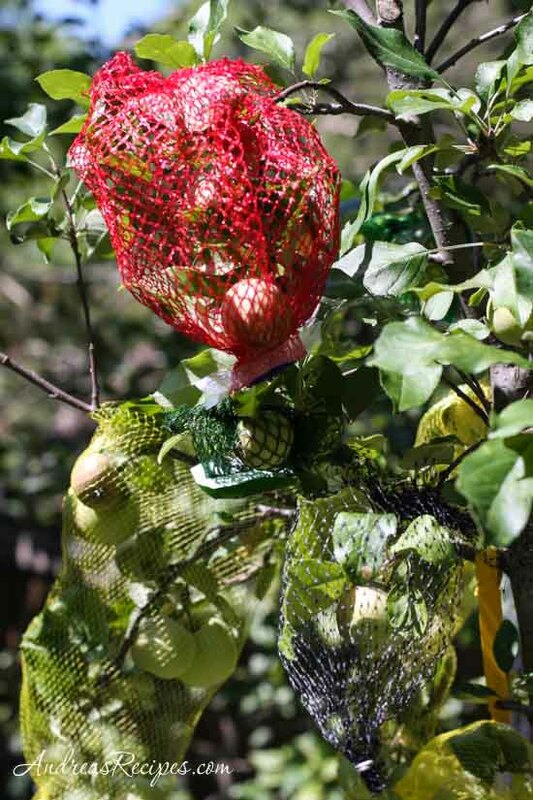 Now that the apples and plums are starting to ripen and the squirrels have begun showing an interest, Michael took some of the net bags and tied them around clusters of fruit. The netting may not keep the insects out, but hopefully it will deter the squirrels and birds. I’m so glad it was helpful! We’re crossing our fingers and hoping for plenty of apples and plums. Oh man! I wish I had found this post about 2 months ago. I lost everything from my plum and peach trees after the squirrels got to them. I’ll be collecting these bags for now one. Thanks so much for an excellent idea! I am having a similar problem with my backyard apple tree. Was your net-bag technique effective? I’m hoping you know by now if this netting helped. 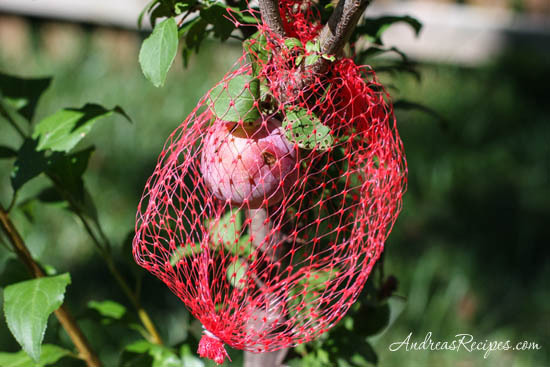 Were you able to save your fruits with this method of netting? Hi Yooni (and Hwan). The bags worked for a while, but squirrels are very persistent and they were eventually able to tear the bags. We are trying other methods, such as building chicken wire cages around the trees.